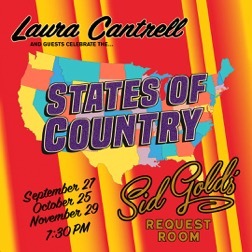 Acclaimed singer Laura Cantrell has confirmed a string of shows this Fall and Winter, beginning with the return of States of Country to Sid Gold’s Request Room, the last Wednesdays of September, October, November, starting September 27. Along with a small combo, Cantrell will be joined by guest performers throughout the series like Smoky Hormel, Chip Taylor, Dave Hansen of acclaimed NY-based swing group Western Caravan, Mary Lee Kortes, The Tall Pines, Fiona McBain and Liz Tormes. Cantrell will also join Chickfactor 25: A Series of Fortunate Events on November 4 at Brooklyn’s Union Pool, and in December, rounds out the year with a trio of shows including a return to favorite house concert, the Roots Hoot in Peace Dale, RI, on December 2, The Hopewell Theater in Hopewell, NJ on December 9 and a special holiday edition of her show at The Outpost In the Burbs in Montclair, NJ on December 16. Cantrell also appears every week this fall as the host of for Dark Horse Radio, a weekly program devoted to the music of George Harrison for SiriusXM’s The Beatles Channel. New shows debut on Thursdays at 2:00 PM Eastern and will be rebroadcast on SiriusXM Channel 18 several times throughout the week.